Add USB 3.0 ports to your Windows based tablet, or any laptop, plus add a separate fast-charge port through a single USB 3.0 connection. This USB 3.0 hub with mobile device stand expands your laptop or tablet connectivity. It works with computers, Windows based tablets, and some On-The-Go-enabled Android devices (when coupled with a separate OTG adapter). Now, you can connect useful peripherals such as a keyboard or an external hard drive to your tablet.Plus, you can quick-charge a separate mobile device via the integrated fast-charge port.Unlike most desktop USB 3.0 hubs, this rugged hub is designed with a solid, high-quality housing. Plus, because it's weighted, it remains stationary when you connect or disconnect your devices. Now you can avoid the aggravation of your hub sliding across your desk when it's touched.Stand makes the hub perfect for mobile devicesThis space-saving USB 3.0 hub provides ergonomically-friendly access to your smartphone or tablet via an embedded flip-up stand. The solid-aluminum, retractable stand features a convenient cable-management hole, so you can quickly cradle your host mobile device while neatly organizing your cables.You can fold the stand down when it isn't need, and because the hub is weighted, there's little risk of a larger tablet flipping over when placed in the stand.You can overcome port limitations on Android based tablets and smartphones by coupling this hub with a simple UUSBOTG Micro USB to USB OTG Adapter (SKU: UUSBOTG - sold separately). With the adapter, the ST4300U3C1 acts as an OTG hub, letting you connect USB devices to your mobile device.The hub is also natively supported by many Windows based tablets with a USB-A port.Alternatively, this small form-factor hub can be used as a traditional USB 3.0 hub, letting you expand your connectivity while remaining backward compatible with USB 2.0 and 1.x devices.Your mobile device can charge faster via the 2.1A combination fast-charge or data port. You can connect your mobile device as a host or you can fast-charge your device, by simply connecting it to the appropriate fast-charge or host port.For devices that aren't USB charged (for example, the Microsoft Surface Pro 4), you can cradle and connect it as a host, while continuing to charge it using its own charging mechanism. Ultrabooks, laptops, and tablets offer portability but often lack connectivity. You can overcome port limitations on Android-based tablets and smartphones by coupling this hub with a simple Micro USB to USB OTG Adapter (SKU: UUSBOTG - sold separately). 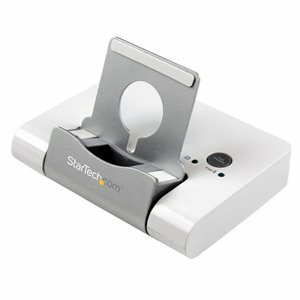 With the adapter, the ST4300U3C1 acts as an OTG hub, letting you connect essential USB devices to your tablet or smartphone, perfect for flash drives and other peripherals. Much like a computer, the hub is also natively supported by many Windows-based tablets with a USB “A”, and the integrated stand lets you conveniently cradle your connected host mobile device. Alternatively, this small form-factor hub can be used as a standard USB 3.0 hub, letting you expand your computer USB port connectivity while remaining backward compatible with USB 2.0 and 1.x specifications. Your connected mobile device can charge quicker via the 2.1A combination fast-charge or data port, fully compliant with USB Battery Charging Specification 1.2. This single, scalable solution lets you connect your mobile device as a host, or you can fast-charge your device by simply connecting it to the appropriate fast-charge or host port. Popular devices such as the Microsoft Surface Pro 3 can be used as the host system and rest in the hubs cradle, your device can continue to charge while using its own charging mechanism. For convenient operation, this space-saving USB 3.0 hub provides ergonomically-friendly access to your smartphone or tablet via an embedded flip-up stand. When connected to your computer, the hub occupies very little space on your desktop, and easily folds into a portable solution, merging standard USB 3.0 hub functionality with an additional combination fast-charge or data port.